This year, our nation recognizes the 50th anniversary of Pat Nixon becoming First Lady. Pat Nixon was a First Lady of many firsts who rose from the humblest and harshest of beginnings to positively impact millions of people in our nation and around the world as she substantively changed the role of the First Lady to include that of official U.S. representative and diplomat. “People are my project,” she said on more than one occasion as she championed volunteerism by lending her significant support to worthwhile organizations across the country; indeed, she personally chaired many prominent national organizations and took an active interest in furthering their missions. 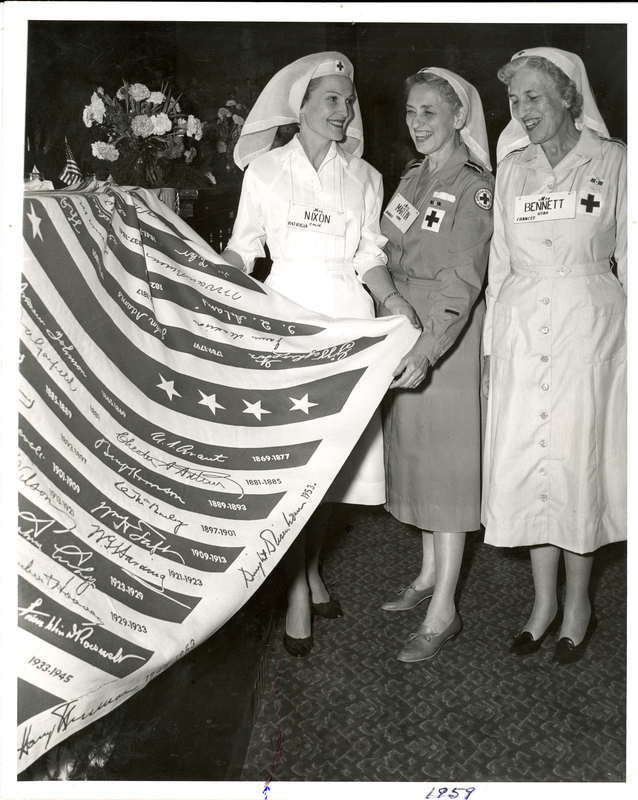 The photo above shows Mrs. Nixon wearing a white Red Cross uniform with Mrs. Everett and Mrs. Martin as the three admire a Presidential Signature flag in 1959. 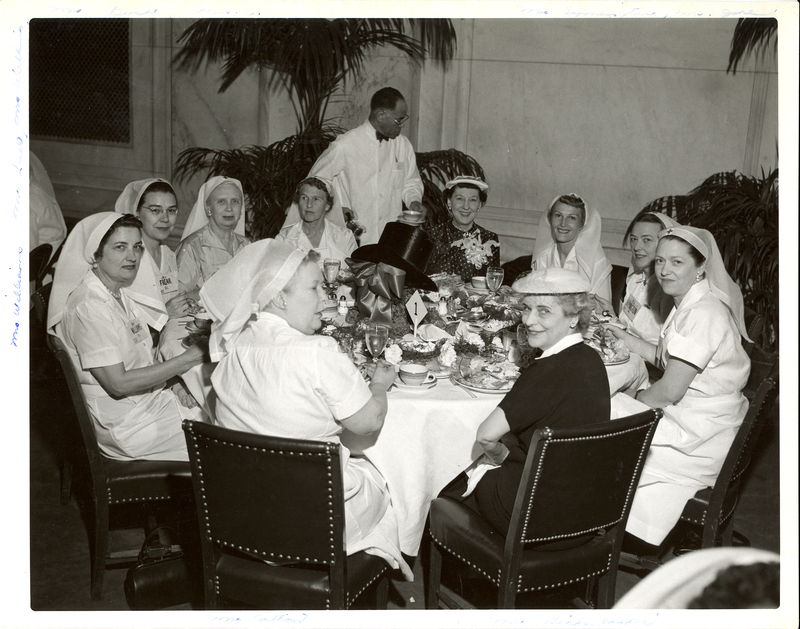 The photo above shows Mrs. Nixon seated next to Mamie Eisenhower at a Senate Ladies Luncheon given in honor of the First Lady, April 24, 1956. Mrs. Nixon wore this white uniform while volunteering for the Red Cross. She began her volunteer days with the Red Cross in the early 1940s as a secretary, and continued to volunteer her time to the agency’s causes. 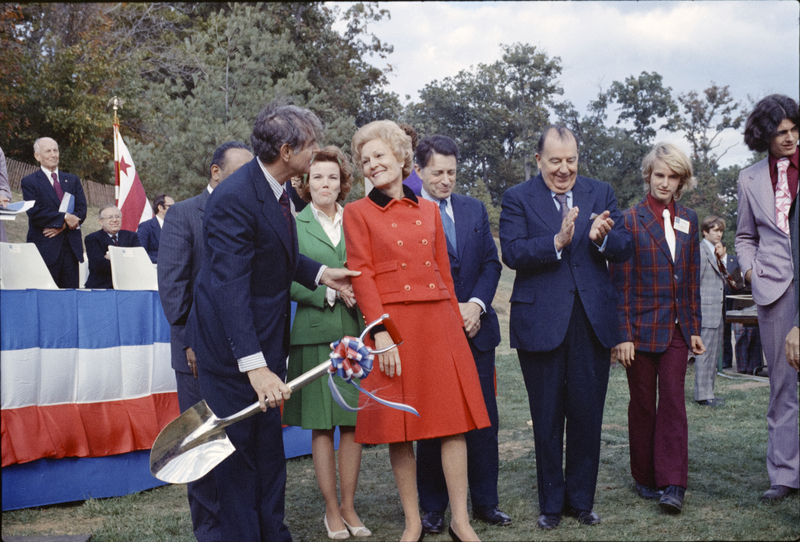 The photo above show Mrs. Nixon with Gallaudet University President, Edward C. Merrill, and KDES/MSSD students, Bill Barber and Nathan Fay (at far right) at the Groundbreaking Ceremony on October 17, 1973, Model Secondary School for the Deaf, Gallaudet University. Designed by Adele Simpson, the red suit is a sleeveless dress with double-breasted jacket with black velvet collar and cuffs. Grand Cross of the Order of the Sun, the highest decoration of the Peruvian Government, presented personally to Mrs. Nixon as a gesture of appreciation for her trip to Peru and her efforts on behalf of the refugees of the earthquake. 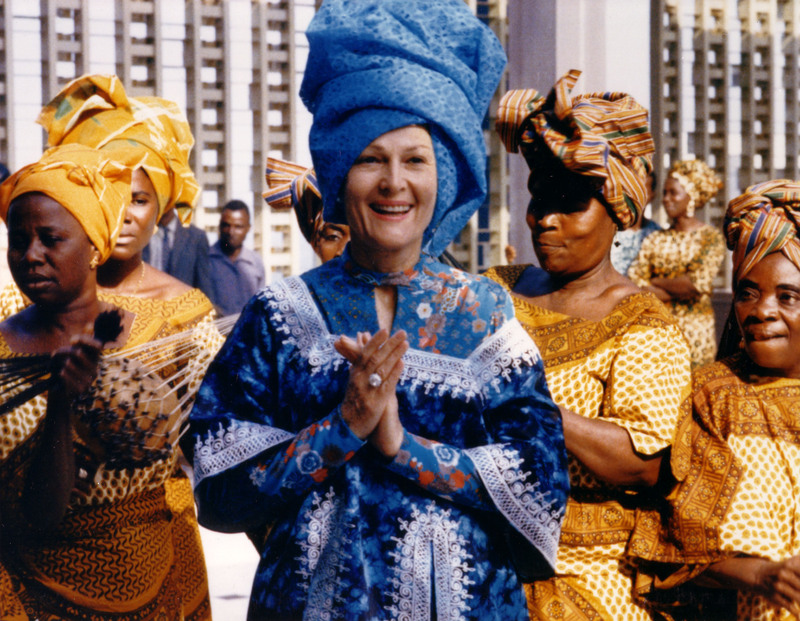 Pat Nixon embarked upon many goodwill tours to represent her husband in various parts of the world. One of her most memorable efforts took place in June of 1970 when she flew to earthquake stricken Peru. While flying on Air Force One, another jet flew in nine tons of relief supplies gathered by volunteers. Peru’s First Lady Consuelo Velasco met Mrs. Nixon in Lima. 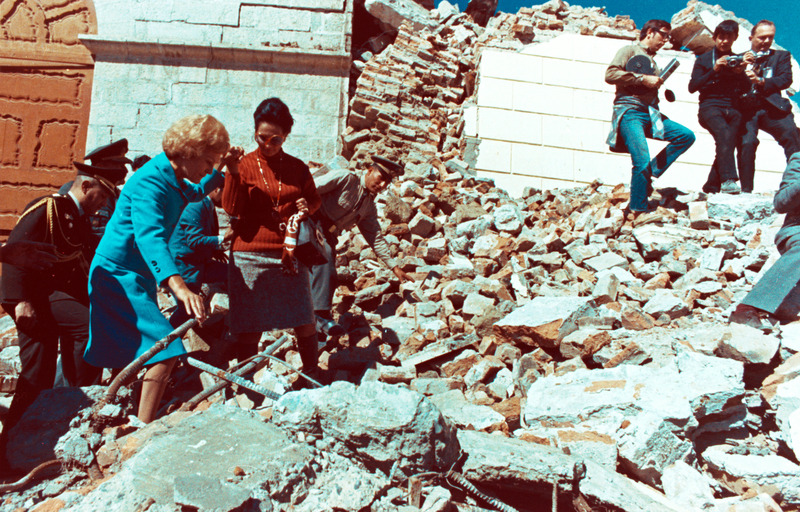 After supplies were transferred to a cargo plane, both first ladies flew to the Huascaran Mountain to deliver the supplies where the earthquake stuck. The President of Peru, Juan Velasco set aside political differences for her courage and awarded Mrs. Nixon the Grand Order of the Sun, one of the America’s oldest established civilian awards since 1821. On January 1, 1972, Mrs. Nixon left for an eight-day trip to Africa, the first visit of a First Lady to that continent and Mrs. Nixon’s second foreign assignment on her own. 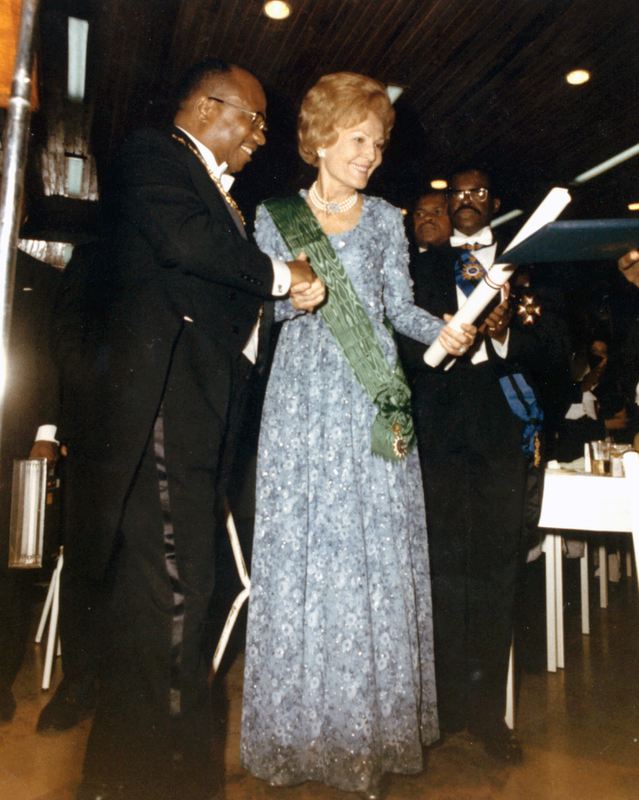 While in Monrovia, Liberia, Mrs. Nixon lead a United States delegation for the inaugural of William R. Tolbert Jr. as the 19th President of Africa’s oldest independent republic. On display is Mrs. Nixon’s Liberian dress and headpiece. 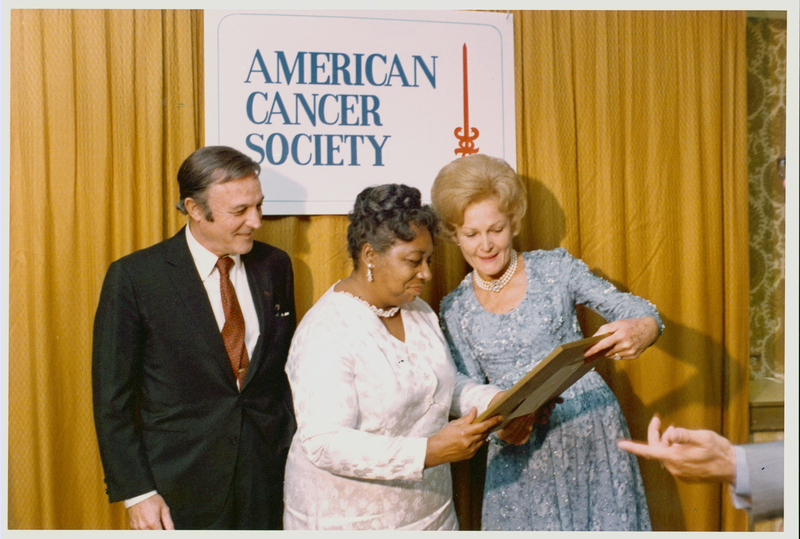 The photos above show Mrs. Nixon on September 21, 1972, at a function in Los Angeles for the American Cancer Society. Mrs. Nixon also wore this gown on a state visit to Liberia on January 3, 1972, and posed for her official White House portrait in it. Designed by Alfred Bosand of New York, the ankle-length gown of organza fabric is overstitched throughout with blue and silver machine embroidery. The empire style waistline is delineated by a two-inch band. With a scoop neck, the bodice is embellished with faux pearls and sequence. Happy Birthday First Lady Pat Nixon.